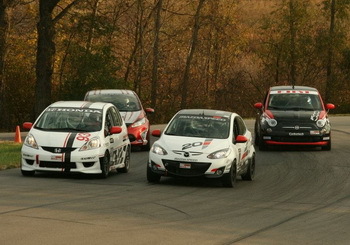 As well as the new new B-spec Fiat 500, a Ford Fiesta, Honda Fit and Mazda2 were also on hand on for the evaluation test conducted at the Grattan Raceway in Michigan under the watchful eye of Sports Car Club of America's staff and rule makers. 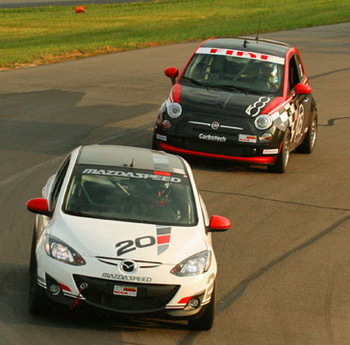 The Fiat 500 has taken to the race track in America for the first time as a new special version, prepared to the SCCA's new affordable entry-level "B-Spec" formula, took part in an evaluation day along with contenders from three other brands. 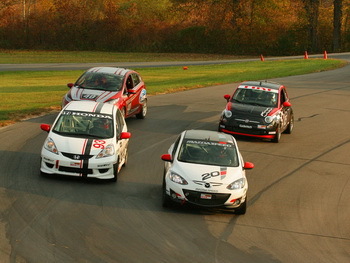 The B-Spec concept is thus now becoming a reality as the four manufacturers put their cars on track at the Grattan Raceway, near Grand Rapids, Michigan, in an effort to firm up specifications for 2012. As well as the Fiat 500 (which is loosely based on the European Abarth 500 one-make "Cup" machine), a Ford Fiesta, Honda Fit and Mazda2 were also on hand on for the test conducted under the watchful eye of Sports Car Club of America's staff and rule makers. Participating manufacturers have tasked SCCA with creating a rules and car specification package that will be universal to the B-Spec program, no matter what sanctioning body conducts the races. BFGoodrich Tires provided control tyres for the single-day test that included running the cars on the road course, as well as on a chassis dynamometer. Drivers Charles Espenlaub (Mazda), Peter Cunningham (Honda), Kuno Wittmer (Fiat) and Andy Vrenko (Ford) took five lap sessions around the track, before coming in and debriefing with the technical staff. Each of the drivers also took turns driving other manufacturers’ cars, with that data included in the overall test data gathered through the AiM system installed on each of the cars. The cars involved in the test were later run with engine restrictors and then with 100 pounds of ballast to see the difference in each car’s lap times. More importantly to the test, the real-world conditions coincided with simulation software that automotive engineer, Kevin Fandozzi, a Championship driver and member of the Showroom Stock/Touring advisory committee to the CRB, had on hand, including the addition of weight and engine restrictors. While SCCA will be including the B-Spec platform in its Club Racing Showroom Stock C class, other professional series will be free to use the universal rule set in their series as well. Grand-Am Road Racing officials Mike Kraemer, Support Series Manager, and David Pettit, Director of Sales and Partnership, were on hand at the test, and the SCCA Pro Racing-sanctioned Pirelli World Challenge has also expressed interest in the package. Plans for the second test are currently being explored before a final rules package will be announced. The tentative test date will most likely come during the month of January.